Even from school, we know how the ancient countries were rich in various myths and legends. And now scientists argue very actively about what was true and what was fiction. Someone thinks myths are nothing more than fairy tales. That’s why they are myths. Others with love in their hearts believe that it was so. One of the plots that have come down from antiquity to modern times was the plot with the goddess Athena and Marcius. His point was that once Athena decided to play the flute. Make a musical instrument, she decided to bone deer. But when the goddess began to play on the made flutes, she pissed off her own image. During the game, her face was not so beautiful, but it looked clumsy. Then Athena got angry and threw the flutes, cursing them. But the tool found Marsyas. And he began to play on it. 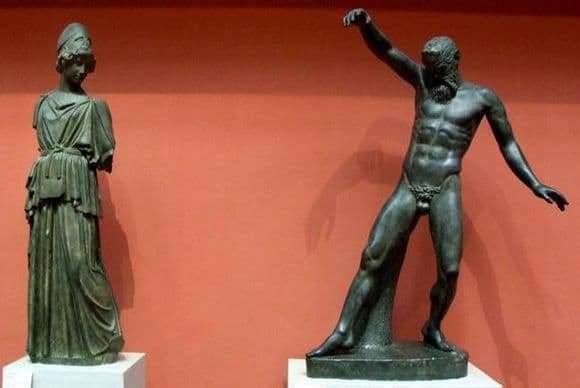 Marsyas was sure that his game was great, his pride was going through the roof. And then Marsyus decided to call Apollo to compete with him. Stupid, he made a big mistake, because Apollo did not tolerate a bold act and ordered to tear off the skin of Marcia. Miron captured the figures of Athens and Marcia, but at the same time understand that the sculpture was enlightened this event recently. Previously, these two statues were considered independent, not comparable to each other. This is not surprising, because indeed, the audience sees different sculptures that are not in contact with each other. The truth of the plot was noticed by chance. And the coin of Athens helped in this. Also, the opinion was mistaken about this sculpture, and because when the statues were discovered, they were reconstructed incorrectly. What caused the wrong interpretation.